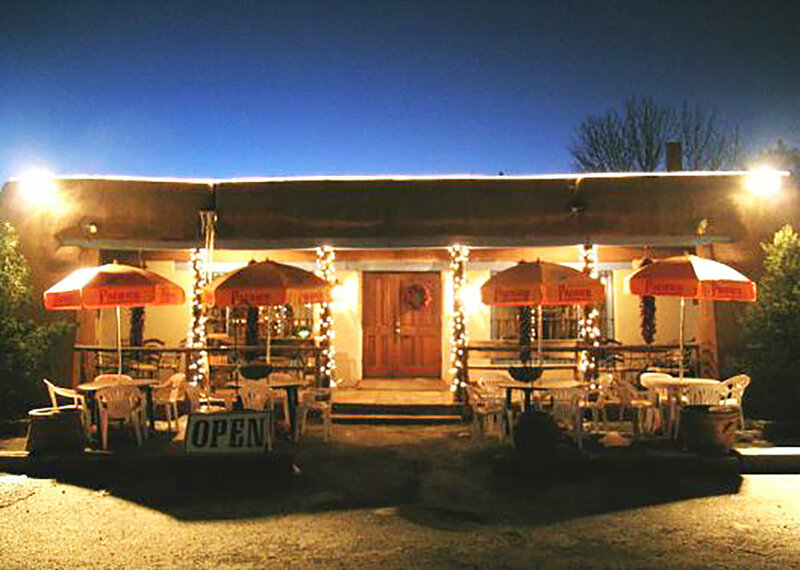 Frankie's at the Casanova is the heart & soul of Northern New Mexican cuisine. 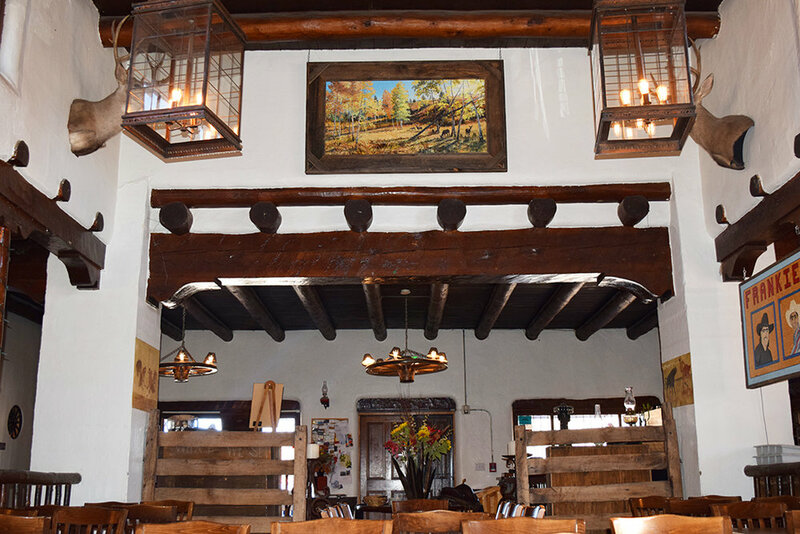 our warming and comfortable restaurant has expanded into a cultural icon within its welcoming western atmosphere. From utilizing the finest ingredients, Frankie's prides itself on freshness that can be seen throughout the numerous cuisines made from scratch each day. This perhaps could be one of the reasons Frankie's have maintained its long standing reputation as an ideal gathering place for both locals and tourists alike. Two egg omelet with bell peppers, onion, tomato & cheese with choice of thick-sliced bacon or sausage, melon, berries & red or green chile. Two scrambled eggs, ham & cheddar jack cheese on a buttered croissant. 6oz. grilled ham steak served with two eggs cooked to any style, seasoned potatoes, red or green chile & choice of honey wheat toast or a flour tortilla. One over hard egg, ham & jack cheese served on an english muffin. One egg over hard,two strips of bacon, diced green chile & american cheese served on a soft jalapeno cheddar bun. Two eggs cooked any style topped over three layers of corn tortillas, cheese, onion & choice of red or green chile. Served with pinto beans, seasoned potatoes & flour tortilla. A giant hand held flour tortilla filled with two scrambled eggs, choice of thick-sliced bacon or sausage & seasoned potatoes. Smother in chile/cheese for an up charge. Layers of corn tortillas, green chile sauce, chicken, cheese & onion, topped with two eggs any style. Served with pinto beans, seasoned potatoes & a flour tortilla. Two buttermilk pancakes served with two eggs cooked any style & choice of two strips of thick-sliced bacon or sausage. Add blueberries or roasted pinon nuts for an up charge. 5oz. chopped pork with sauteed onions, two eggs cooked any style, side of seasoned potatoes, pinto beans, choice of chile & a flour tortilla. Two eggs cooked any style with choice of thick-sliced bacon or sausage, seasoned potatoes, side of chile - red or green & honey wheat toast or a flour tortilla. Two thick slices of freshly baked multi-grain bread grilled golden brown & served with two eggs cooked any style. Choose from thick-sliced bacon or sausage. Layers of corn tortillas, red chile sauce, ground beef, cheese & onion, topped with two eggs any style. Served with pinto beans, seasoned potatoes & a flour tortilla. Homemade queso with fresh tortilla chips. Chips covered with queso, chicken, melted cheese, whole beans & red or green chile. Homemade salsa with fresh tortilla chips. Avocado, bacon bits, diced ham, shredded cheese, diced tomatoes and a boiled egg served over fresh romaine lettuce & spring greens. Choose from Ranch, Blue Cheese, Italian or Vidalia Onion dressing. Lunch salad served with your choice of dressing & a cup of green chile stew. 4oz. grilled seasoned steak served over fresh romaine lettuce, spring greens & tomatoes. Choose from Ranch, Blue Cheese, Italian or Vidalia Onion dressing. 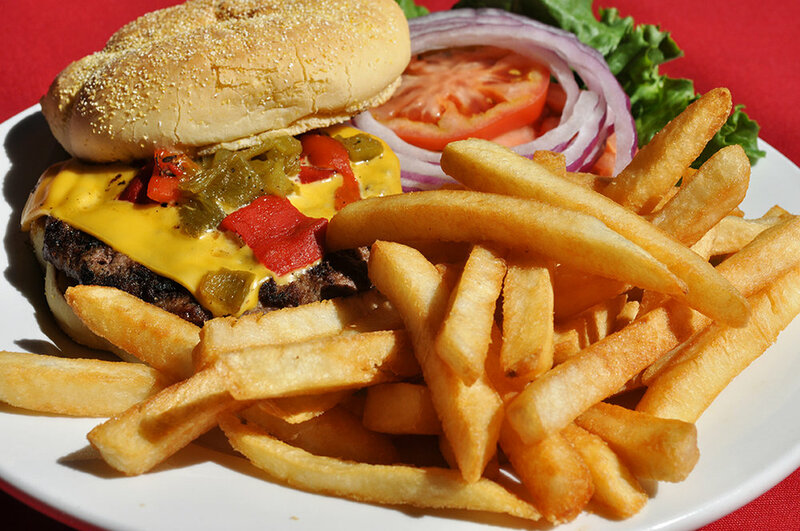 1/2 of any sandwich, choice of green chile stew or chips & choice of beverage. Frankie’s famous green chile stew with green chile, potatoes & pork. 6 oz. grilled lemon pepper chicken served over fresh romaine lettuce, spring greens, tomatoes & onions. Choose from Ranch, Blue Cheese, Italian or Vidalia Onion dressing. 5oz. grilled salmon served over fresh romaine lettuce, spring greens, tomatoes, onions, avocado & strawberries. Choose from Ranch, Blue Cheese, Italian or Vidalia Onion dressing. Layers of corn tortillas, green chile sauce, chicken, cheese & onion. Served with pinto beans, seasoned potatoes & a flour tortilla. 1/4lb. lean roast beef with cheddar cheese, pinto beans & wrapped in a giant tortilla. Smothered in your choice of chile red or green. Layers of corn tortillas, red chile sauce, ground beef, cheese & onion. Served with pinto beans, seasoned potatoes & a flour tortilla. 1/4lb. chicken with cheddar cheese, pinto beans & wrapped in a giant tortilla. Smothered in your choice of red or green chile. 6oz. ground beef layered with green chile, American cheese lettuce, tomato & onion placed on a kaiser roll. Served with chips. Upgrade to a variety of sides for an upcharge. monterey, colby & jack cheese, lettuce & tomato. Choice of mustard, mayo or ranch dressing. Served with chips. Upgrade to a variety of sides. 1.25oz of ham, turkey & roast beef stacked on swiss & jack cheese, lettuce, tomato & onion. Served with chips. Upgrade to a variety of sides. 6oz. grilled chicken with American cheese, diced green chile, lettuce, tomato & onion. Served on a kaiser roll. Served with chips. Upgrade to a variety of sides. 4oz. smoked turkey with shredded monterey, colby & jack cheese, lettuce & tomato. Choice of mustard or mayo. Served with chips. Upgrage to a variety of sides. Sauteed bell peppers, onions, tomatoes, monterey jack & cheddar cheese. Served with chips. Upgrade to a variety of sides. Ham, turkey & roast beef with shredded monterey, colby & jack cheese, lettuce & tomato. Choice of mustard or mayo. Served with chips. Upgrade to a variety of sides. 1/4lb. smoked turkey, slice of jack cheese, chipotle mayo. Served with chips. Upgrade to a variety of sides. 1/4lb. thin sliced ham, slice of swiss cheese & honey mustard. Served with chips. Upgrade to a variety of sides. 1/4lb. lean roast beef, slice of swiss cheese & roasted red pepper. Served with chips. Upgrade to a variety of sides. 1/4lb. smoked turkey, jack cheese, swiss cheese, lettuce, tomato & onion. Served with chips. Upgrade to a variet of sides. 1/4lb. sliced ham, jack cheese, swiss cheese, lettuce, tomato & onion. Served with chips. Upgrade to a variety of sides. 1/4lb. lean roast beef, jack cheese, swiss cheese, lettuce, tomato & onion. Served with chips. Upgrade to a variety of sides. Chips garnished with salsa, guacamole & queso. Battered & fried avocados served with a side of salsa. 4 jumbo shrimp with cocktail or tartar sauce. Homemade salsa with fresh corn tortilla chips. Homemade green chile queso with fresh corn tortilla chips. Homemade guacamole with fresh corn tortilla chips. Fresh romaine lettuce, spring greens, tomatoes & onions. Choose from Ranch, Blue Cheese, Italian or Vidalia Onion dressing. Frankie’s famous green chile stew with green chile, potatoes & pork. Upgradge to a bowl for a slight upcharge. Frankie’s famous green chile chicken mushroom cream soup.Upgradge to a bowl for a slight upcharge. Choose from lean roast beef or roasted chicken. 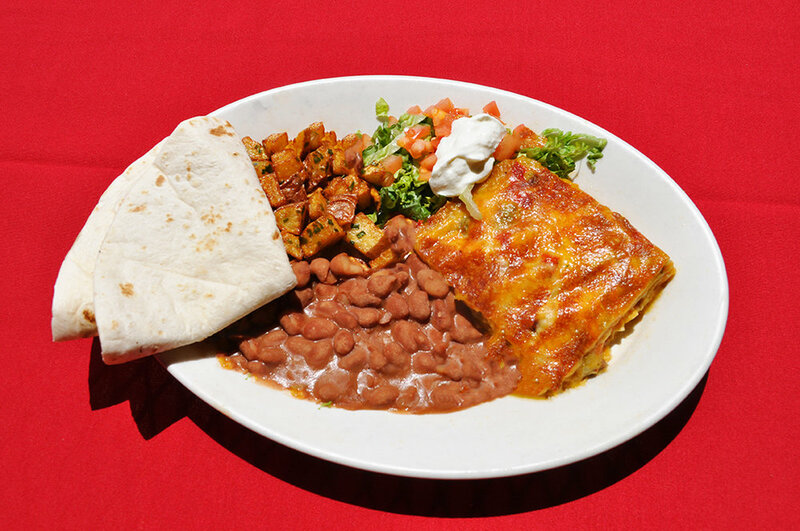 Served with cheese, pinto beans & wrapped in a giant tortilla. Smothered in your choice of red or green chile. Three hard shell tacos with your choice of lean ground beef or chicken filled with cheddar cheese, onion, tomato & lettuce. Served with pinto beans & a side of salsa. 5oz. diced pork with sautéed onions, seasoned potatoes, pinto beans, choice of red or green chile & a flour tortilla. Chicken, melted cheese & onions grilled between two flour tortillas. Served with pinto beans & your choice of red or green chile. 6oz. Hamburger patty grilled to perfection with cheese & wrapped in a giant flour tortilla. Smothered in your choice of red or green chile. Served with seasoned potatoes & pinto beans. 6oz. ground beef layered with green chile, american cheese lettuce, tomato & onion placed on a kaiser roll. Served with chips. Upgrade to double meat, a variety of sides or a jalapeno cheddar bun for an upcharge. 6oz. pork chop grilled to perfection & served with either a rolled cheese enchilada or french fries. 8oz. steak grilled to perfection & served with either a rolled cheese enchilada or french fries. Upgrade to a 12oz or add fried ship for an upcharge. 3 pc. cod lightly fried & dipped in beer batter. Served with french fries or sweet potato fries. Looking for a private dining room to host your next special occasion? from graduation parties and wedding receptions, to birthday parties and private luncheons. -Drive North on I-25 N/US-85 N/US-84 S toward Las Vegas/Clines Corners for about 15 miles. -Take EXIT 299 toward NM-50/Glorieta/Pecos. -Make a left, crossing over the bridge onto NM-50. -Once at the end, turn right to stay on NM-50. -Drive 5.90 miles down until you enter into the village of Pecos. -At the four way stop, make a right onto S Main St/NM-63. -Frankie’s will be on the right hand side.